Astronomers using the National Science Foundation's Very Long Baseline Array (VLBA) radio telescope have tracked the motion of a violent region where the powerful winds of two giant stars slam into each other. The collision region moves as the stars, part of a binary pair, orbit each other, and the precise measurement of its motion was the key to unlocking vital new information about the stars and their winds. Both stars are much more massive than the Sun -- one about 20 times the mass of the Sun and the other about 50 times the Sun's mass. The 20-solar-mass star is a type called a Wolf-Rayet star, characterized by a very strong wind of particles propelled outward from its surface. The more massive star also has a strong outward wind, but one less intense than that of the Wolf-Rayet star. The two stars, part of a system named WR 140, circle each other in an elliptical orbit roughly the size of our Solar System. "The spectacular feature of this system is the region where the stars' winds collide, producing bright radio emission. We have been able to track this collision region as it moves with the orbits of the stars," said Sean Dougherty, an astronomer at the Herzberg Institute for Astrophysics in Canada. Dougherty and his colleagues presented their findings in the April 10 edition of the Astrophysical Journal. 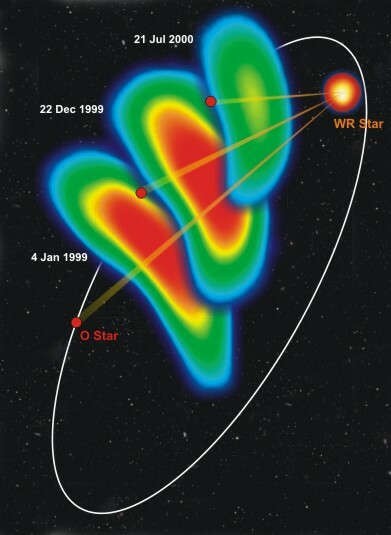 The supersharp radio "vision" of the continent-wide VLBA allowed the scientists to measure the motion of the wind collision region and then to determine the details of the stars' orbits and an accurate distance to the system. "Our new calculations of the orbital details and the distance are vitally important to understanding the nature of these Wolf-Rayet stars and of the wind-collision region," Dougherty said. "People have worked out theoretical models for these collision regions, but the models don't seem to fit what our observations have shown," said Mark Claussen, of the National Radio Astronomy Observatory in Socorro, New Mexico. "The new data on this system should provide the theorists with much better information for refining their models of how Wolf-Rayet stars evolve and how wind-collision regions work," Claussen added. The scientists watched the changes in the stellar system as the star's orbits carried them in paths that bring them nearly as close to each other as Mars is to the Sun and as far as Neptune is from the Sun. Their detailed analysis gave them new information on the Wolf-Rayet star's strong wind. At some points in the orbit, the wind collision region strongly emitted radio waves, and at other points, the scientists could not detect the collison region. "No other telescope in the world can see the details revealed by the VLBA," Claussen said. "This unmatched ability allowed us to determine the masses and other properties of the stars, and will help us answer some basic questions about the nature of Wolf-Rayet stars and how they develop." he added. The astronomers plan to continue observing WR 140 to follow the system's changes as the two massive stars continue to circle each other.